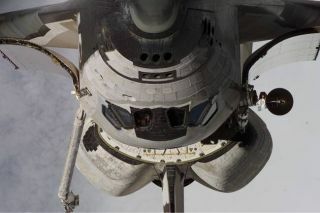 NASA's space shuttle Discovery, seen here in an orbital view taken during its STS-116 mission by International Space Station astronauts, is due to land on Dec. 22, 2006. Astronauts on the shuttle Discovery are battling a broken antenna and alooming space station docking, but they weren't too busy Tuesday to find outwho won the men's NCAA basketball championship title last night. "Houston, Discovery, we're wondering if you could tell us who the Final Fourmen's champion was," radioed shuttle commander Alan Poindexter to MissionControl. The astronauts launched into space Monday morning on the first of NASA's ownfinalfour" shuttle flights before the fleet is retired later this year. Back to the big game, basketball powerhouse Duke University faced offagainst underdog Butler University for the NCAAMen's Basketball Championship title in Indianapolis, Ind., Monday nightwhile Poindexter and his crew were working in orbit. Mission Control put the astronauts on hold while flight controllers calledup the results from what has been billed as a thrilling championship game. "Duke won 61 to 59 at the last minute," Mission Control said afterchecking the score. "Aww man, that sounds like great game," Poindexter said. "Congratulations to the Blue Devils at Duke." Poindexter and his crew have likely not had much time for their own sportsin space. The astronauts are headed to theInternational Space Station to deliver a cargo pod packed with tons of newscience gear, supplies and spare parts for the orbiting laboratory. The astronauts inspected Discovery's heat shield for damage earlier todayand will sleep through most of the day because of their overnight shiftschedule. The shuttle is due to dock at the space station Wednesday morning at3:44 a.m. EDT (0744 GMT). Three spacewalks are planned for the 13-day mission, the first of which isset to begin Friday. SPACE.com is providing complete coverage of Discovery's STS-131 missionto the International Space Station with Managing Editor Tariq Malik and StaffWriter Clara Moskowitz based in New York. Click here for live shuttlemission updates and a link to NASA TV.